A new class of complex ‘high-entropy’ metal carbides that incorporate five different metals has been developed by researchers in the US, who have shown the new materials can be significantly harder and more heat resistant than simple carbides. Metal carbides such as tungsten or titanium carbide are valued for their toughness and high melting points, and are widely used in mining tools and thermal protection coatings. But most carbides used today consist of just one metal cation combined with carbon. ‘These “binary” carbides are so useful because of the extremely strong bonds between the metal and the carbon atoms,’ explains materials engineer Kenneth Vecchio of the University of California, San Diego. ‘However, there’s a trade-off: the bond that makes materials like tungsten carbide very hard and stiff also makes them very brittle. 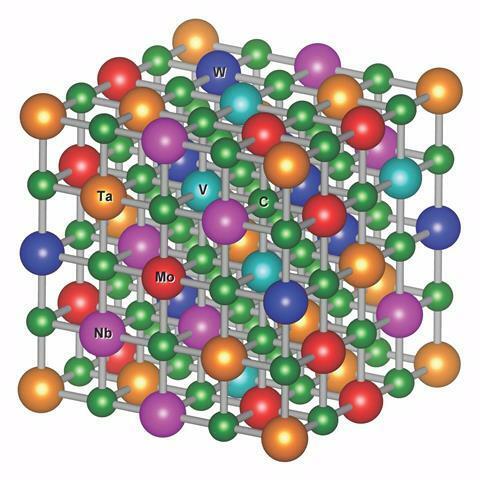 There are a few materials like tantalum carbide that are softer and less stiff but also more ductile.’ In theory, it may be possible to beat this trade-off by combining different carbides together into a single material with several different metal ions. This is no trivial task, however. The researchers considered all possible carbides containing five of eight possible metals – a total of 56 possible materials. ‘We tried to make sure that, in the three dimensional lattice, each metal atom’s nearest metal neighbour was always a different species,’ explains Vecchio. ‘So there’s rarely two hafnium atoms or two titanium atoms next to each other. That aspect of the structure, which is very rare in ceramics, is key to making these materials significantly harder.’ However, even predicting which of these carbides could be synthesised was difficult. Thankfully, materials scientist Stefano Curtarolo’s team at Duke University in North Carolina and Fritz Haber Institute in Berlin have for several years been developing a high-throughput program called AFLOW (Automatic Flow for Materials Discovery) to calculate material properties. Curtarolo’s group defined a new parameter called the entropy-forming ability – the propensity of a material to form a highly-disordered, single-phase crystal. They calculated the value of this parameter for all 56 carbides. When Vecchio’s group attempted to synthesise the single-phase carbides, ‘the model performed perfectly,’ says Curtarolo: those with high values of entropy-forming ability could be synthesised, those with low values separated into simpler carbides. Moreover, some materials showed exceptional mechanical properties: MoNbTaVWC5 is still being tested, but Curtarolo would be unsurprised if it turned out to be ’the hardest material with the highest melting point ever made’. The researchers then intend to look for mixed materials that combine, for example, hardness and ductility.